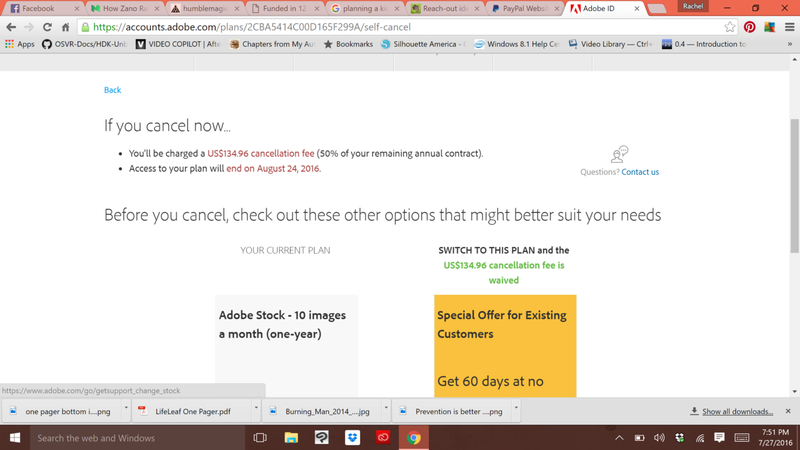 Slammed with an Adobe Stock early cancellation fee on a “risk free” trial? Slammed with an Adobe Stock early cancellation fee on a “risk free” trial? Me too — and I got it reversed. Like most designers, I use Adobe. It’s industry standard. I have an Adobe Creative Cloud membership. I’ve always used a standard, owned version of Adobe CS before, but when I heard that Adobe isn’t supporting any version except Creative Cloud, I decided to switch. I almost never use stock photos, but for one particular project I found myself needing some. I remembered that I had seen an advertisement on my Adobe sign in for the new Adobe Stock Photos. Seems like a good deal! No indication that this isn’t a standard, run of the mill free trial. Close examination of the wording shows that there’s more info to be had here, but the wording is close enough to the standard, first month free type situation that I certainly didn’t go looking for loopholes. And to the best of my knowledge, no other information was provided to me in a clear, easy to find manner. I signed up, downloaded a few stock photos, and then forgot about it until I noticed that I was being charged $49.00 a month for my Creative Cloud membership, and $29.00 a month for my additional Adobe Stock membership. “Oh shoot! I forgot to cancel that membership after the free month,” I thought. Um, what!? This is nuts — I can’t believe what I’m seeing. Adobe is a large, well respected company. This type of scammy, bleed-them-dry deceptive fees are unbelievable in such a company. I jumped on Adobe chat immediately. Here’s a transcript of my chat. info: Thank you for your patience. While you wait, you can try our community forums, where experts are available 24 hours a day, 7 days a week to answer your questions. You can also chat with Adobe experts live on Twitch. See our schedule for Ask the Experts LIVE, and get “How To” video live streams, ask questions, and learn new skills! info: You are now chatting with Jagadish. Please don’t close the chat window or browser tab since it will end our chat session. Jagadish: Thank you for contacting Adobe Membership Services. Jagadish: Nice to have you on chat! Jagadish: How are you doing today? Jagadish: I understand that you would like to terminate your Adobe Stock — 10 images a month (one-year) membership with us, am I right? Jagadish: Sure, I will look into your account right away to view exclusive offers for your membership. Jagadish: Please stay connected while I check your membership status and savings that you are entitled to . Jagadish: May I know the reason for cancellation? Jagadish: Thank you for the information. Jagadish: What could we have done to help you use the product more? Rachel Lang: The product is fine. I just don’t use stock photos often enough to need it. Jagadish: Okay, While these details load, I’d like to know why you first chose Adobe? Jagadish: I am pleased to know that. Jagadish: I check and see that you are enrolled with Adobe Stock — 10 images a month (one-year) ordered on 24 May 2016 with the order number AD020651513, that is a annual subscription which gets billed every month automatically. Am I right? Rachel Lang: My understanding is that I signed up as a trial, with the first month being refunded and that I could cancel at any time. Yes, it is being billed monthly now. info: Your chat transcript will be sent to rachellang@(myemail) at the end of your chat. Jagadish: I am really sorry that you were not aware of annual commitment. Jagadish: The subscription was free for only one month. Jagadish: I am really sorry to inform you that if you decide to cancel now, you will have early termination fee. Jagadish: Taking this into consideration, I can offer you 1 month free so that you can continue using your Adobe membership. Jagadish: So, would you like to apply this offer to keep your membership active till the end of the subscription commitment? Jagadish: I certainly understand your concern, You know, I’d be upset, too, if that happened to me. Jagadish: However, only for you, if you wish to complete your annual commitment, I can help you with 2 free months, as an exception. Rachel Lang: NO. This is disgusting. I am cancelling my account. Jagadish: Okay, please stay online, let me check for an exception. Jagadish: Thank you for your patience. Jagadish: I have a good news for you, I have got an exception from my supervisor to cancel the Adobe Stock — 10 images a month (one-year) subscription with out any fees, Rachel. Jagadish: Hence, I have successfully cancelled the Adobe Stock — 10 images a month (one-year) subscription for you without any fee as an exception and you will get the confirmation email within 24 hours. Jagadish: Is there anything else I can help you with? Rachel Lang: Thank you very much. I will keep my adobe creative suite account then. Jagadish: You are welcome, Rachel. Jagadish: You may receive an email that will contain a link to complete an optional survey to provide your feedback on our conversation today. Jagadish: The survey takes less than 2 minutes to complete and I would really appreciate your feedback. Jagadish: Thank you for contacting Adobe. We are available 7 days a week, 24 hours a day. Goodbye! As you can see, when I threatened to leave entirely, they were able to cancel this fee. While I was on chat, I was also surfing the Adobe forums about this issue. No surprise, there were many, many posts about outraged customers having this exact issue. I have successfully cancelled the Adobe Stock — 10 images a month (one-year) subscription for you without any fee as an exception and you will get the confirmation email within 24 hours. Feel free to contact us for further assistance. We are available 24 hours a day, 7 days a week. Very shortly afterwards, my account was updated and I’m not longer subscribed to Adobe Stock. Overall, this was handled VERY quickly, even though they tried to divert me. However, I’m still really disillusioned over the incident. I feel like Adobe shouldn’t be pulling this kind of nonsense. Thoughts, anyone? Has this happened to you? Was it resolved?